Madras, the former name for today’s bustling metropolis – Chennai, was founded on the 22nd of August, 1639 when a deal on a small patch of land (now Fort St.George) was struck between the East India Company and the local Nayak rulers. From the fort, grew many settlements, villages and towns that later congregated together as the city of Madras. Despite some of its flaws, today the city of Chennai boasts of supremacy in the IT, Education, Automotive, Healthcare and Movie industries. What first began as a humble salute to the culture and spirit of this unique, coastal city by a bunch of enthusiastic city dwellers and journalists since 2004, has now expanded to ‘Madras walks’ that include everything from heritage walks, poetry and quizzes to photo exhibitions and bike tours. This year, as the city celebrates its 376th anniversary, Madras Day is being celebrated from August 16th to 23rd as Madras Week. The city of Chennai had its roots in a humble fishing village. It would have stayed so, if not for August 22nd 1639: the day the British bought a strip of land on the Coromandel coast and set about building Fort St. George. Madraspattinam was the sleepy fishing village which lent the colonials a name for the place; Chennapattanam, the name the locals gave to the town. Lazy pronunciation shortened them to the catchier “Madras” and “Chennai”. The city soon became a thriving naval port and after independence, the capital of the newly formed state of Tamil Nadu. Going from strength to strength, the city was and still is one of India’s most thriving metropolises. In this blog, we trail the city’s climb from its humble beginnings to its modern avatar – in pictures. Before either Madraspattinam or Chennapattanam however, there was Fort St. George – the East India Company’s fortified warehouse and the heart of their trading activities down south. Today it serves as the administrative headquarters for the Tamil Nadu legislative assembly. There’s a museum as well, where you can see old relics from the fort’s English past. For lack of inspiration, this was the name given to the settlement which sprung up around Fort St. George. Later this came to be called Chennapattnam – from which we get the name Chennai. The neighbourhood is one of the most bustling areas in Chennai today. You can chart the history of Chennai under the Raj by looking through this church, called the Westminster Abbey of the East. It’s also the oldest British building in India and the oldest Anglican church East of the Suez. Virtually unchanged in character, Rajaji Salai (or First Line Beach Road) was and still is the city’s major financial district. One of the oldest ports in India, it formed the backbone of the East India Company’s operations in South India and was the only place in India to have been attacked during the First World War. Today it is one of the busiest ports in India, second only to Mumbai. Parry’s building, when it was built, was the first six-storey building in Chennai. Today the area is one of the area’s key commercial districts and a six storey building would hardly cause anyone to bat an eyelid. Also located at Parry’s corner, the Madras High Court was built in 1862 and is the second largest judicial complex in the world. This long sandy beach, the second longest in the world, is your average Chennaites go-to place for weekends. Once a quiet and secluded beach, today it attracts 30,000 visitors daily. Its other attractions include a series of statues of various important Chennaites. The original Napier Bridge was an ordinary iron bridge built in 1869. The Napier Bridge we know today, with its six bowstrings and ethereal lighting at night, was built in 1999. Or as its official title goes, Thiruvallur Thattai Krishnamachari Road. Once a quiet, leafy road, today it is a bustling shopping area. Better known as Anna Salai today, the road is Chennai’s lifeline, stretching from Fort St. George on one end to Kathipara Junction at the other, branching eventually into the Grand Southern Trunk Road. Formed artificially by joining the Coovam and the then Elambore river, the island marks the starting point of Anna Salai road and is the location of the iconic Munro Statue. Once every motorist’s nightmare, Kathipara junction is now something of a dream, with a clover-leaf flyover (the largest of its kind in Asia) replacing the old roundabout. India’s oldest department store. Then, India’s oldest mall. Spencers Plaza is iconic. The original Indo-Saracenic facade may be gone, but the legend lives on in the form of one of India’s largest malls. Book lovers recognize this as India’s oldest bookstore. Others might recognize the name as “the place we buy books from at railway stations”. The original Higginbotham’s, however, lies on Anna Salai, not in your nearby railway station and was established in 1844. Now known as Bharathi Salai, the road is best known for its bookstores – its secondhand bookstores in particular. A fusion of the Gothic and Romanesque styles of architecture, the station was originally built to supplement Royapuram station – but then ended up surpassing it to become one of the key stations in South India. There was a time when you could take your taxi all the way up to your carriage and board the train in comfort. Then they switched over to wide-gauge engines and now, you have to find your way through the crush like at every other station. A veritable cocktail of architectural styles, fusing the Gothic, Ionic and Corinthian, this building forms the seat of the Chennai Corporation. One of the first examples of the Indo-Saracenic architectural style in India, the 224 year old building served as the office of the revenue board and Public Works Department until it was nearly burnt down in a fire in 2012. 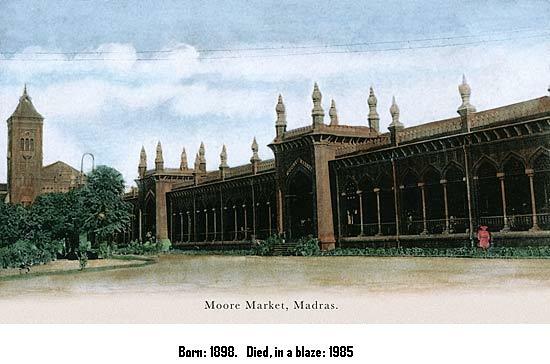 Built in 1898 to house the hawkers of Chennai, Moore market became more famous for its flea market – where you could pick up antiques and rare book titles at bargain prices. A year before it was to be handed over to Southern Railway for a car park to be built, it went up in flames. Today, Moore market is no more and in its stead stands a terminal of the Chennai Suburban railway. Artist’s impression of Moore Market. If you are a die-hard ‘Chennaite’ or an avid fan of old Madras – with its lovelyKanchivarams, Filter coffee, Kuthu Paattu, Traditional Art & Dance, Kollywood, Authentic Thalis and more, share this post now! Tell us what your favorite thing about Madras is – comment below!